Our striped 1/2" worsted wool twill tapes meet strict specifications historically set forth by official written order (such as the Royal Warrant) to British, American or European army command. 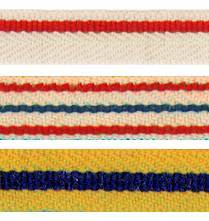 Typically, an individual trim was of a particular twill weave structure incorporating anywhere from one to four stripes or "worms" set on a natural white background, either symmetrically or offset. This uniform trimming then identified the soldier, which was important where the fire and smoke of battle limited visibility. Please list your choice of Style when ordering; or send us documentation, drawings and color samples for your particular regimental lace (minimum order required), and we will be happy to work with you. Please note that prices below are for striped lace only, and do not apply to candy- striped or zig-zag patterns.